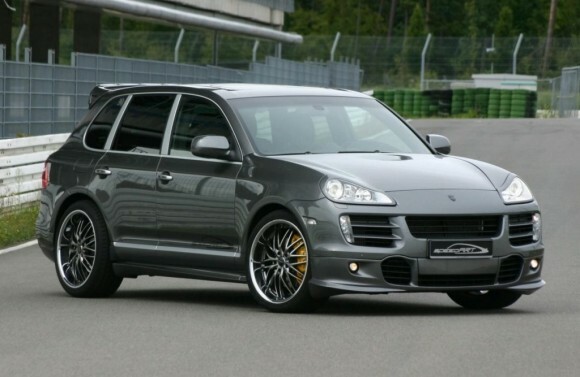 European-based tuner speedART is offering an upgrade kit for the Porsche Cayenne Diesel. The conversion starts on the exterior where a new front spoiler with fog lamps, side skirts, a rear apron, a roof spoiler and 22-inch wheels are fitted. Optional LED daytime running lights provide even more visual appeal. A sport exhaust system with special double pipes promises a deep and impressive growl. Three levels of power are offered for the speedART TITAN DTR range: 280 hp, 290 hp and 310 hp. The top conversion includes a larger VTG turbocharger and is priced at €4,360. For cars which already have air suspension systems installed an electronic lowering module is offered, while those with normal suspensions can be fitted with an adjustable system or lowering springs. High performance brakes with larger discs are recommended due to the cars’ characteristics. The interior can be decked out in Alcantara while the steering wheel comes padded with F1-type shift paddles. Other gadgets include a boost gauge with a Sports Chrono-inspired design and a speedo background colored in the customer’s desired shade.